This area, known originally as Frog Creek, received its first American settlers before the Civil War. Many of them came from Alabama, northern Florida, and Georgia. Among the Georgians was Daniel Gillett, who brought his family to Frog Creek in the late 1840s. 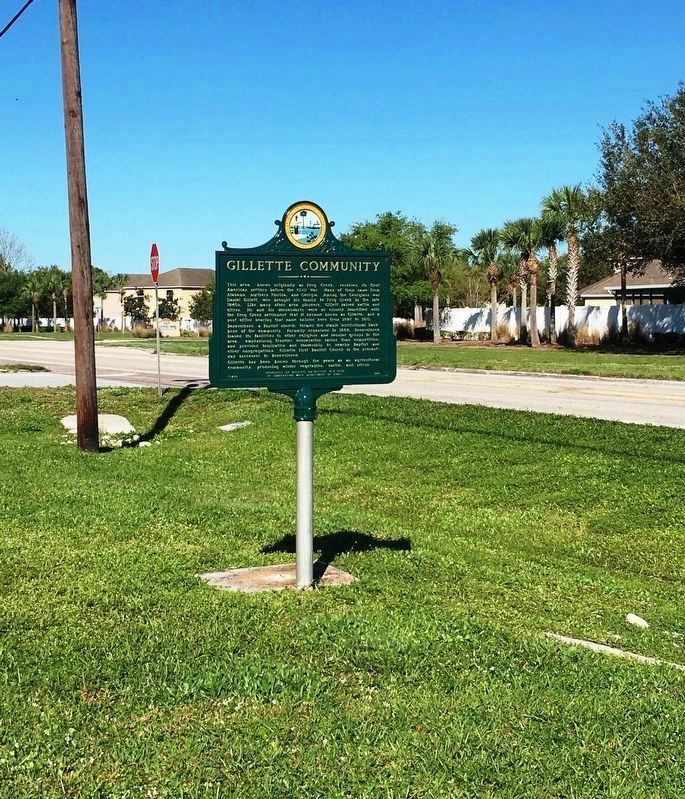 Like many other area pioneers, Gillett raised cattle and citrus. He and his descendants were so closely identified with the Frog Creek settlement that it became known as Gillette and a post office bearing that name existed here from 1895-1910. Benevolence, a Baptist church, formed the stable institutional backbone of the community. Formally organized in 1868, Benevolence loaned its facilities to other religious and secular groups in the area, emphasizing frontier cooperation rather than competition, and provided inspiration and leadership to nearby Baptist and other congregations. Gillette First Baptist Church is the present-day successor to Benevolence. 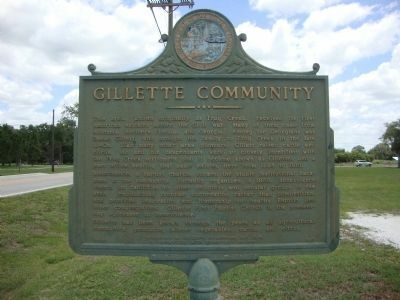 Gillette has been known through the years as an agricultural community, producing winter vegetables, cattle, and citrus. Location. 27° 36.077′ N, 82° 31.694′ W. Marker is near Palmetto, Florida, in Manatee County. Marker is at the intersection of Moccasin Wallow Road and Ellenton-Gillette Road, on the left when traveling west on Moccasin Wallow Road. Touch for map. Marker is at or near this postal address: 3301 Moccasin Wallow Road, Palmetto FL 34221, United States of America. Touch for directions. Other nearby markers. At least 8 other markers are within 6 miles of this marker, measured as the crow flies. Rubonia Women's Club (approx. 2.2 miles away); Terra Ceia School/Village Improvement Association Hall (approx. 3.8 miles away); Atzeroth Home Site (approx. 4 miles away); Guerrero Home Site (approx. 4.6 miles away); Gamble Sugar Cane Mill (approx. 4.9 miles away); Old Memphis Cemetery (approx. 5.1 miles away); Danger Approaches (approx. 5.4 miles away); Realizing a Dream (approx. 5.4 miles away). Touch for a list and map of all markers in Palmetto. More. Search the internet for Gillette Community. Credits. This page was last revised on March 14, 2019. This page originally submitted on July 28, 2013, by Tim Fillmon of Webster, Florida. This page has been viewed 344 times since then and 20 times this year. Last updated on March 10, 2019, by Brandon D Cross of Flagler Beach, Florida. Photos: 1. submitted on July 28, 2013, by Tim Fillmon of Webster, Florida. 2. submitted on March 10, 2019, by Brandon D Cross of Flagler Beach, Florida. • Bernard Fisher was the editor who published this page.